Safely removes swirls, oxidation, etc. 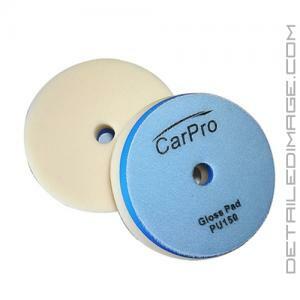 Remove imperfections and leave behind a mirror like finish with the CarPro Gloss Pad! Car enthusiasts love to have that deep and glossy shine that really turns heads. If you have some haze on the surface after a heavier pad and polish combo, or if you have just light imperfections in your paint, the CarPro Gloss Pad is a great pad to use with your favorite finishing or light polish. The 1 1/4" thick pad will remove haze, light oxidation, light swirls, etc. with ease and help enhance the natural shine of your paintwork. The secret to this pad comes in the unique Japanese open cell polyurethane foam (white), which is specifically designed for producing a high gloss finish. You will also notice the dense urethane interlayer (blue) on the bottom of the pad. This layer is stiff and helps you easily maintain even pressure over curved surfaces while allowing vibration from the polisher to be absorbed before it reaches the front, or polishing surface of the pad. This neat safety feature allows the polishing particles to do their job, without the vibration affecting performance, which only means one thing, more gloss! The CarPro Gloss Pad should be your pad choice if you are looking to leave behind an incredibly glossy surface! Great "soft" polishing pad on the very final step of paint correction to bring-out the shine & luster, whether its Sonax, Meguiars, or 3D Speed polish. Good polishing pad when used with essence. I used with my PC on speed level 4, 3-4 passes the car shines to another level. These are great pads with CarPro Essence and Essence Plus. Soft pads that just enhance the gloss with these two products. They also work great with Gyeon Q2 Primer Polish. Thank you for great support and quick turnaround!